Erica Garner—activist, organizer, writer, comrade, sister, mother and daughter—is the recipient of the 2018 Shorty Award for social media activism. Reggie Harris, Garner’s friend, business partner and political adviser, accepted the award on her behalf. As The Root previously reported, Erica Garner died Dec. 30, one week after suffering a heart attack brought on by a severe asthma attack Christmas Eve. 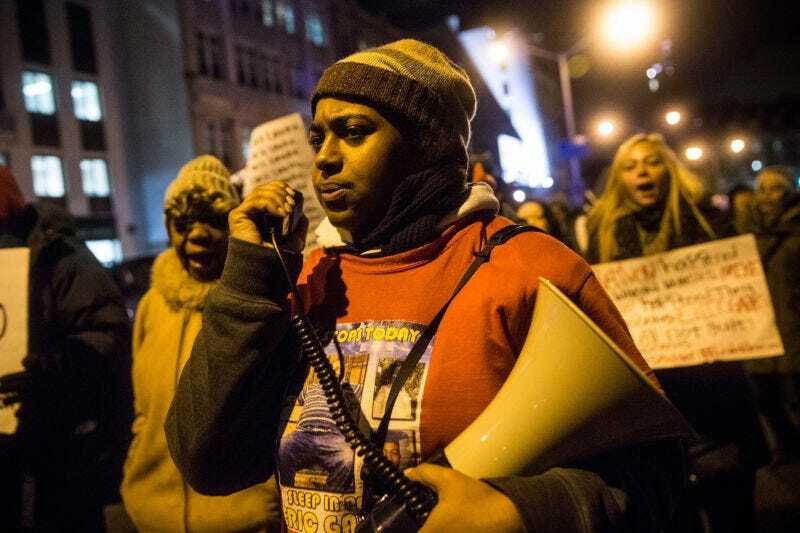 Holding so much grief and rage, Erica Garner decided that she would not stand still while the wheels of injustice ran over her family as they have and continue to run over families ripped apart by state violence. She staged “die-ins” on the same Staten Island, N.Y., street corner where Pantaleo choked her father to death in broad daylight. She stood tall as a radical voice for the black left, calling out Democrats, including New York City Mayor Bill de Blasio, for their complicity in the mass criminalization of black and brown people. From her commitment to speaking out against the war on drugs to her advocacy for prison abolition, Erica Garner understood that none of us are free until all of us are free, and she used social media to make that clear every single day. She understood social media’s power and potential, and used it as one effective tool in her fight for justice for her father. That is the reason why video of the NYPD killing of Eric Garner went viral. It’s also the reason #ICantBreathe was used all over Twitter and in protests around the country. “Social media has helped to spread Erica’s message, giving it even greater reach and allowing it to live on, after she unfortunately passed away,” Gregory Galant, Shorty Awards co-founder and MuckRack CEO, said in an exclusive statement to The Root. “Social media is still a medium that can be used for good, and people who we honor, such as Erica, have done that,” Galant said. Although Erica Garner received this award for her digital activism, her digital activism was simply an extension of her taking it to the streets, and to the Justice Department, and all the way to the president of the United States. She will always be remembered as the revolutionary black woman she was. Other nominees in the Shorty Awards “Activism” category included Tarana Burke, founder of the #MeToo movement and senior director of Girls for Gender Equity, as well as DeRay Mckesson, co-founder of Campaign Zero, a campaign dedicated to police and criminal justice reform. Harris, who accepted the award on Erica Garner’s behalf, told The Root that while he is grateful Garner was recognized, he wished that she had received the award before her death. “It’s very important to me that Erica was thought of. I would have liked for her to receive the award while she was here to appreciate it, but better late than never,” Harris said. Twitter allowed Erica to control and amplify her message. She had the ability that not many activists had. She was as comfortable and loved in the streets as she was online. Twitter is the only reason she got to endorse Bernie [Sanders] and was able to tell the world what really happened when ABC and [then President Barack] Obama tried to play her and make her look crazy. I think that Tarana Burke deserved the award this year for the fight that she is and has been fighting both in real life and online. But Erica damn sure put the work in to earn it in previous years. The Shorty Awards should be commended for even thinking of uplifting activists and activism through social media. I hope they continue to uplift activists and their work, particularly black women, who more often than not point us in the way of what’s right. The 10th annual Shorty Awards, which honored social media content creators and producers, took place Sunday evening at the PlayStation Theater in New York City’s Times Square.